'Picked these up at a hamfest and broke my rickety folding cart getting them to the car. 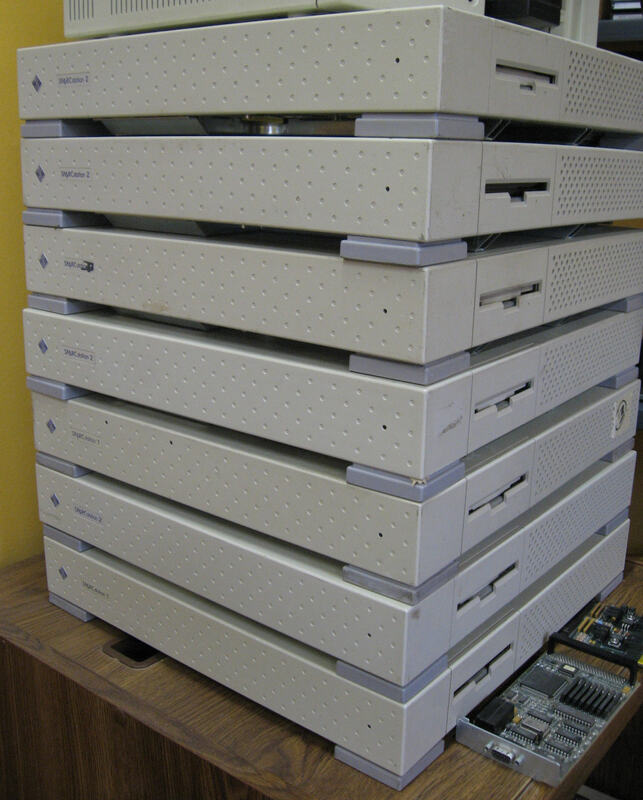 Since these are 1989 vintage machines, their NVRAM batteries have long since expired. There's a replacement "how to" located at www.obsolyte.com. The essence of which is that the replacement NVRAMs were reengineered a few years ago and no longer work in the Sparcstations. The only solution now is to open up an existing NVRAM and splice in a coin cell battery holder. Which, in my opinion, is a better long term fix anyway as it makes future battery replacement easier. Even with dead NVRAMs, the Sparcstations can be booted. These lack "frame buffers" so connecting a laptop with terminal software to their serial ports and powering up get one to the OpenBOOT prompt. The Sun site has an OpenBoot Command Refererence. I was able to load OpenBSD V4.4 from a bootable CD. These machines require a SCSI CD-ROM drive set to "block" mode. There are several older drives that can be set to "block" mode by changing a jumper. I used a Plextor PX-12TSi mounted in an external case (found out the hard way that the case's SCSI ID switch wasn't connected). I've also found that older Pioneer CD-ROM drives are capable of "block" mode. Starting with everything off, connect laptop to serial port using null modem cable. Boot laptop and open Hyperterminal. Set to 9600, N, 8, 1 and no flow control. Set the external CD-ROM drive's SCSI address to 6 and connect it to the Sparctstation's SCSI port. Power up CD-ROM drive and put in the OpenBSD boot disk. Power up Sparctstation. 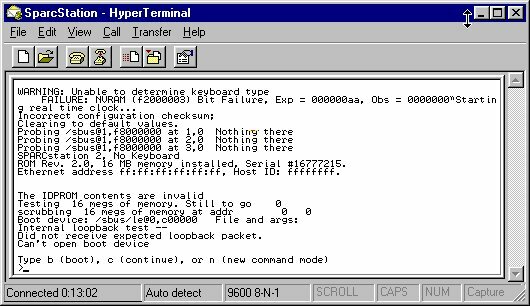 It may take a few minutes for the boot process to complete and arrive at the "Type b (boot)..." prompt. If the Sparcstation has been configured to boot to the hard drive, you won't get the OpenBOOT prompt. Instead, it'll boot into whatever OS has been previously loaded. In that case, reboot the Sparcstation and press when the "banner" appears (containing "Ethernet Address:..."). At the OpenBOOT prompt, enter N for "new command mode"
Enter "probe-scsi" to see the attached SCSI devices. There should be two: the hard drive should be at address 3 and the CD-ROM should be at address 6. To boot from the CD, enter "boot cdrom"
The OpenBSD load is pretty self-explanatory. 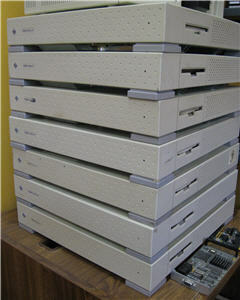 I did find that the Sparcstation's 540MB hard drives weren't large enough to include the games and man pages. Also, it appears that OpenBSD accesses the Internet to get some of its files. After loading is complete, power off the Sparcstation, remove disk from CD-ROM drive, power it off and disconnect the SCSI cable. Restart the Sparcstation and when the OpenBOOT prompt displays, enter "boot disk" to boot the to hard drive.